"St. Petersburg Times" redirects here. For the weekly newspaper in Russia, see The St. Petersburg Times. The Tampa Bay Times, previously named the St. Petersburg Times through 2011, is an American newspaper published in St. Petersburg, Florida, United States. It has won twelve Pulitzer Prizes since 1964, and in 2009, won two in a single year for the first time in its history, one of which was for its PolitiFact project. It is published by the Times Publishing Company, which is owned by The Poynter Institute for Media Studies, a nonprofit journalism school directly adjacent to the University of South Florida St. Petersburg campus. Many issues are available through Google News Archive. A daily electronic version is also available for the Amazon Kindle and iPad. 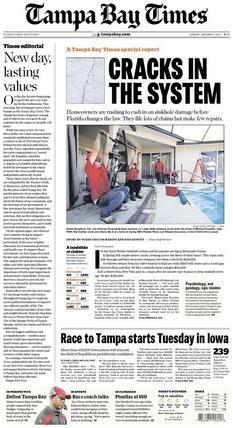 The January 1, 2012, front page of the first edition of the Tampa Bay Times. The newspaper traces its origins to the West Hillsborough Times, a weekly newspaper established in Dunedin, Florida on the Pinellas peninsula in 1884. At the time, neither St. Petersburg nor Pinellas County existed; the peninsula was part of Hillsborough County. The paper was published weekly in the back of a pharmacy and had a circulation of 480. It subsequently changed ownership six times in seventeen years. In December 1884 it was bought by A. C. Turner, who moved it to Clear Water Harbor (modern Clearwater, Florida). In 1892 it moved to St. Petersburg, and by 1898 it was officially renamed the St. Petersburg Times. The Times became bi-weekly in 1907, and began publication six days a week in 1912. Paul Poynter, a publisher originally from Indiana, bought the paper in September 1912 and converted to a seven-day paper, though it was rarely financially stable. Paul's son, Nelson Poynter, became editor in 1939 and took majority control of the paper in 1947, and set about improving the paper's finances and prestige. Nelson Poynter controlled the paper until his death in 1978, when he willed the majority of the stock to the non-profit Poynter Institute. In November 1986, the Evening Independent was merged into the Times. Poynter was succeeded by Eugene Patterson (1978–1988), Andrew Barnes (1988–2004), Paul Tash (2004–2010; chair and chief executive officer of the Poynter Institute and the Times Publishing Company since 2010) and Neil Brown (2010–2017). On January 1, 2012, the St. Petersburg Times was renamed the Tampa Bay Times; this stemmed from a 2006 decision of a lawsuit with Media General, at the time the publishers of the Times' competing newspaper, The Tampa Tribune, which allowed that paper to keep its exclusive right to use the name of its defunct sister paper, The Tampa Times, for five years after the decision. As the newly rechristened Tampa Bay Times, the paper's weekday tabloid tbt*, a free daily publication and which used "(* Tampa Bay Times)" as its subtitle, became just tbt when the name change took place. The St. Pete Times name lives on as the name for the Times' neighborhood news sections in southern Pinellas County (formerly Neighborhood Times), serving communities from Largo southward. The Times has also done significant investigative reporting on the Church of Scientology, since the church's acquisition of the Fort Harrison Hotel in 1975 and other holdings in Clearwater. The Times has published special reports and series critical of the church and its current leader, David Miscavige. In 2010, the Times published an investigative report questioning the validity of the United States Navy Veterans Association, leading to significant reaction and official investigations into the group nationwide. On May 3, 2016, the Times acquired its longtime competitor The Tampa Tribune, with the latter publication immediately ceasing publishing and Tribune features and some writers expected to be merged into the Times. As reported by other local media outlets in the Tampa Bay area at the time of this acquisition, for many years the Tampa Tribune was considered to be the more conservative newspaper in the region, while the Tampa Bay Times was thought of as more liberal. The Times' purchase of The Tribune also allowed its circulation area to be expanded into Polk County, placing it in competition with other newspapers such as The Lakeland Ledger and The Polk County Democrat, as well as into the south central region of the state known as the Florida Heartland. In the case of the latter, the Times published Highlands Today, which was a daily news supplement of The Tribune for readers in Highlands County. The Times sold the paper in 2016 to Sun Coast Media Group. The newspaper created PolitiFact.com, a project in which its reporters and editors "fact-check statements by members of Congress, the White House, lobbyists and interest groups…" They publish original statements and their evaluations on the PolitiFact.com website, and assign each a "Truth-O-Meter" rating, with ratings ranging from "True" for completely true statements to "Pants on Fire" (from the taunt "Liar, liar, pants on fire") for false and ridiculous statements. The site also includes an "Obameter", tracking U.S. President Barack Obama's performance with regard to his campaign promises. PolitiFact.com was awarded the Pulitzer Prize for National Reporting in 2009 for "its fact-checking initiative during the 2008 presidential campaign that used probing reporters and the power of the World Wide Web to examine more than 750 political claims, separating rhetoric from truth to enlighten voters." The Times sold PolitiFact.com to its parent company, the Poynter Institute, in 2018. ^ "eCirc for Newspapers". Audit Bureau of Circulations. September 30, 2011. Archived from the original on March 17, 2013. ^ Shankland, Stephen (September 8, 2008). "Google raising newspaper morgues from the dead". CNET News. Retrieved December 17, 2009. ^ a b c d e f g "Times History". Times Publishing Company. 2015. Retrieved June 13, 2018. ^ a b Staff (2007). "St. Petersburg Times History – From 1884 to present". St. Petersburg Times. Archived from the original on August 18, 2009. Retrieved November 12, 2009. ^ a b c Deggans, Eric (November 1, 2011). "The St. Petersburg Times will become the Tampa Bay Times on Jan. 1". St. Petersburg Times. Archived from the original on February 8, 2012. Retrieved April 3, 2012. ^ Tobin, Thomas C.; Childs, Joe (June 23, 2009). "The Truth Run Down". St. Petersburg Times. Archived from the original on February 9, 2013. Retrieved June 23, 2009. ^ Casey, Dan; Sluss, Michael (May 16, 2010). "Fla. Contributor to Va. Campaigns Raises Questions – A Man Who Lived in Florida and Gave $67,500 to Virginia Campaigns Is Under Investigation". The Roanoke Times. Archived from the original on September 14, 2012. Retrieved February 11, 2013. ^ a b Sunde Farquhar (May 3, 2016). "Tampa Bay Times buys, shutters Tampa Tribune". WFLA. ^ "'Tampa Bay Times' buys, shuts down rival 'Tampa Tribune'". USA Today. May 3, 2016. Retrieved May 3, 2016. ^ "A note from our publisher". Highlands Today. May 4, 2016. Archived from the original on May 6, 2016. ^ "PolitiFact.com". St. Petersburg Times. Retrieved August 27, 2009. ^ "The Obameter". Politifact. Retrieved April 8, 2017. ^ a b c "2009 Pulitzer Prize Winners & Finalists". The Pulitzer Prizes. Retrieved June 13, 2018. ^ "2013 Pulitzer Prizes - Editorial Writing". www.pulitzer.org. ^ Staff (March 13, 2004). "Times writer's stories earn her 2003 Ernie Pyle Award". St. Petersburg Times. p. 3B. ^ "2012 Pulitzer Prizes - JOURNALISM". www.pulitzer.org. ^ Sentinel Staff Report (June 18, 2010). "Orlando Sentinel wins 17 awards from Florida Society of News Editors". Orlando Sentinel. Retrieved June 18, 2010. ^ Staff (June 18, 2010). "FSNE Gold Medal for Public Service". Florida Society of News Editors. Retrieved June 18, 2010. Inside Scientology – The St. Petersburg Times reporting on the Church of Scientology is in the finest traditions of American journalism. The reporting by Joseph Childs and Thomas Tobin stands out for the ways in which it held accountable the powerful. ^ "The Pulitzer Prizes – Finalists 2010". Columbia University. Retrieved April 12, 2010. ^ a b c d e f g h Nohlgren, Stephen (April 20, 2009). "St. Petersburg Times wins two Pulitzer Prizes". St. Petersburg Times. Archived from the original on April 22, 2009. Retrieved April 20, 2009. ^ McElroy, Jack (April 26, 2009). "Paperless project claims a Pulitzer". Knoxville News Sentinel. p. 60. ^ Young, Charles William (April 23, 2009). "St. Petersburg Times earns two Pulitzer Prizes for journalism". Congressional Record. p. E950–E951. ^ a b Staff (March 10, 2007). "Scripps winners named". The Kentucky Post. p. A5. ^ "The Pulitzer Prizes – Finalists 2007". Columbia University. Retrieved December 5, 2009. ^ St. Petersburg Times staff (March 13, 2004). "Times writer's stories earn her 2003 Ernie Pyle Award". St. Petersburg Times. p. 3B. ^ Staff (March 2, 2002). "Two Times reporters earn national awards". St. Petersburg Times. p. 3B. ^ a b "The Pulitzer Prizes – Finalists 2000". Columbia University. Retrieved December 5, 2009. ^ a b Staff (April 18, 1999). "Times earns national reporting awards". St. Petersburg Times. p. 3B. ^ Leisner, Pat (April 16, 1998). "Indianapolis native wins Pulitzer Prize". Post-Tribune. Associated Press. p. B5. ^ a b "The Pulitzer Prizes – Finalists 1998". Columbia University. Retrieved December 5, 2009. ^ "The Pulitzer Prizes – Finalists 1997". Columbia University. Retrieved December 5, 2009. ^ "Prizes honor wide range of stories; Winners of the 1995 Pulitzer Prizes in Journalism included stories of natural disaster, human tragedy and courage". Portland Press Herald. Associated Press. April 19, 1995. p. 7A. ^ "The Pulitzer Prizes – Finalists 1995". Columbia University. Retrieved December 5, 2009. ^ "The Pulitzer Prizes – Finalists 1992". Columbia University. Retrieved December 5, 2009. ^ "Barberton native wins a Pulitzer". Akron Beacon Journal). Associated Press. April 10, 1991. p. A1. ^ Marx, Gary (April 25, 1985). "Pulitzer winners: UCF student, St. Pete Times". Orlando Sentinel. p. A1. ^ "The Pulitzer Prizes – Finalists 1982". Columbia University. Retrieved December 5, 2009. ^ Staff (April 16, 1980). "Pulitzer Prize board, for first time, names finalists in all categories". The Boston Globe. ^ "The Pulitzer Prizes – Finalists 1980". Columbia University. Retrieved December 5, 2009. ^ Staff (May 28, 1981). "Martin O. Waldron Is Dead at 56; Reporting Led to a Pulitzer Prize". The New York Times. Retrieved July 13, 2010. ^ Garloch, Karen (April 1, 1988). "Observer wins Pulitzer Prize for coverage of PTL, Bakkers". The Charlotte Observer. p. 1A. James F. Tracy (2008). "Strikebusting in St. Petersburg: Nelson Poynter's Postwar Assault on Union Printers". American Journalism. 25. T. R. Goldman (2015). "What will happen to the Tampa Bay Times?". Columbia Journalism Review. 53 (6). Wikimedia Commons has media related to Tampa Bay Times.